Moses Mzolisi Nqontsha, Universal Promise Liaison, is a much-beloved associate of Universal Promise. Two years before UP was even a blink of an idea, Moses invited eventual UP founder into Nomathamsanqa township to shed light on his community's inequities. In doing so, Moses exposed the educational imbalances in the place he has called home since the mid-1970s. Years later, Moses still shares - with a respectful, firm approach - his highly regarded opinions and cultural expertise and helps shape his community's goals by offering input on matters surrounding educational opportunities, infrastructure, leadership, healthcare, and financial freedom. In recognition of his longterm loyalty to Universal Promise and all those we serve, UP named the main hall in the brand new academic center after Moses. His role in our formation and our evolution is well documented and is now forever memorialized in the plaque that resides in the center. Nokuzola Somya, Vusumzi Primary School Liaison, is a long-standing and beloved Xhosa teacher at Vusumzi Primary School. Nokuzola serves as the direct link between the educators and Universal Promise and is the main contact through whom educators share their wish-list of educational supplies, infrastructure improvements, field-trip design, professional development, and general feedback. Nokuzola is a force at VPS and is known for her infectious sense-of-humor, honest opinions, and timely follow-through. When UP is planning a volunteer trip, orchestrating the renovation of rest rooms, upgrading the water system, or seeking intervention about overcrowded classrooms, we count on Nokuzola for her devotion to the school community, her peers, and her students. We are grateful for her strong presence as an educator and as a collaborator with UP. Ntombizodwa Sothozama, Computer Laboratory and Inkuthazo Liaison, is one of the shining stars at Vusumzi Primary School. Ntombizodwa, who earned a certificate in computer education, agreed to take on the role of computer instructor soon after Universal Promise installed a state-of-the-art laboratory at VPS. Since that time, Ntombizodwa has systematically augmented her computer role by devising an all-school laboratory access schedule, teaching learners of all ages how to use the twenty-first century technology, researching the jewels of the Internet, photographing all grade levels as they master skills (from fraction computation to word-processing), and even ringing the bell on time, so that classes run more smoothly. Ntombizodwa has found new joy and purpose in the students of Vusumzi, and we are beyond grateful for her passion, compassion, and loyalty as UP introduced VPS to the incalculable impact of technology. Phaphama Mofu, Uphuhliso Liaison, is the consummate multi-dimensional partner to Universal Promise. She can do it all, simultaneously, without fanfare and with incisive clarity. UP contends Phaphama could rise to be President of South Africa in no time and do an unprecedented job! She carries out her role as assistant to the principal at the same time that she coordinates UP efforts at Vusumzi Primary School. Phaphama distributes school uniforms to those in need, photographs Uphuhliso recipients, facilitates the translation of the UP medical pamphlet, cooks a mean dumpling, and extends the highest degree of graciousness, respect, gratitude, and humor! When UP is in a bind, and we need to turn to someone who will bring anything to fruition in record-time, we turn to Phaphama for her opinions and follow-through, and she never disappoints. Phaphama will not stop until VPS students receive the kind of quality education they deserve and should expect. Nombulelo Dyantyi, Ilizwe Empowerment Liaison, is the official head of the crafting program. From the very beginning, Nombulelo has been a fair, collaborative, and measured coordinator, one who leads by example and insists on kindness and professionalism in her actions and throughout the organization. Nombulelo has led the team through the early stages of simplistic bracelet design to more complex crocheted items to intricate cultural beaded wares (such as Xhosa anklets, necklaces, and belts) to free-flowing dresses and toasty knitted scarves. Nombulelo and her co-leaders, Vuyokazi Baxana and Nothemba Nokhetshe, merge their particular skills and approaches seamlessly and are eager to advance this crafting effort to ensure financial freedom and quality educational opportunities for all. Fezeka Dyani, Ilizwe Empowerment Liaison, is the UP in-country consultant for Ilizwe EmPOWERment. Fezeka has a distinguished history in the crafting field and was the primary manager for a once-thriving crafting program outside Cape Town, where she was in charge of taking orders, ensuring quality, filling requests, overseeing employees, marketing, shipping, inventorying, and budgeting. Fezeka is on-call to assist with Ilizwe efforts in South Africa and has led effective workshops and discussions with Ilizwe members. Fezeka hails from the Eastern Cape, speaks Xhosa and English flawlessly, and is a living, breathing example of what is possible in leadership. The Ilizwe members welcomed Fezeka's expertise and guidance and are looking forward to additional sessions as Ilizwe defines, refines, and enacts its vision for the future. Charlie Josephs, Development Trust Liaison and Director of the Mayibuye Ndlovu Development Trust, plays a vital role in connecting Universal Promise efforts in the United States with those on the ground in South Africa. Charlie is the UP jack-of-all-trades, assisting with our Inkuthazo, Uphuhliso, and Ilizwe Programs when need arises and offering incomparable guidance regarding all sorts of protocol, from local decision-making and Department of Education policy to governmental procedures and record-keeping. Charlie's breadth of involvement, from the small to the grand, has been extensive: anything from organizing transport for school blazer measurement to securing data regarding student pass rate to collaborating on social enterprise for financial empowerment. Charlie is a non-voting member of our Board of Directors. Click here for more information about Charlie and his connection to Universal Promise. Siyabulela Rabie, English-Xhosa Translator, first came to the attention of UP in 2010 when he was a student at Nelson Mandela Metropolitan University (renamed Nelson Mandela University). Siya has since graduated from NMU with distinction and now serves as a Social Worker in Cape Town. Siya's most recent impactful UP collaboration involved his translation (from English to Xhosa) of the UP-funded medical pamphlet . The task was a painstaking one, but Siya accepted it without hesitation and maintained a focus until the very end, ensuring that not only were the words correct, but that the punctuation and spacing were correct, too. UP will circulate thousands of copies of the pamphlet to local clinics and use it as an educational tool for parents and students throughout Nomathamsanqa. The Siya-UP relationship remains a splendid model of well established mutual support and gratitude. Mary Ellen Lynch, Uphuhliso Coordinator, earned a Master’s Degree in International Educational Development and has devoted her life to refugee advocacy, refugee settlement, and community engagement. Mary Ellen has presented at the United States Committee for Refugees and Immigrants National Conference and merged her professional and educational backgrounds as an adjunct professor at the university level. There she broadens and redefines the lens through which students see the world and nurtures effective communication skills to promote global understanding and change. Robin Porter Carlo, Inkuthazo Afterschool Tutoring Coordinator, earned Bachelor’s and Master’s degrees in Special Education and has worked as a reading specialist for over three decades, providing literacy instruction to students with dyslexia. She also worked for Wilson Language Training, where she developed a curriculum as well as professional development opportunities for literacy instruction. 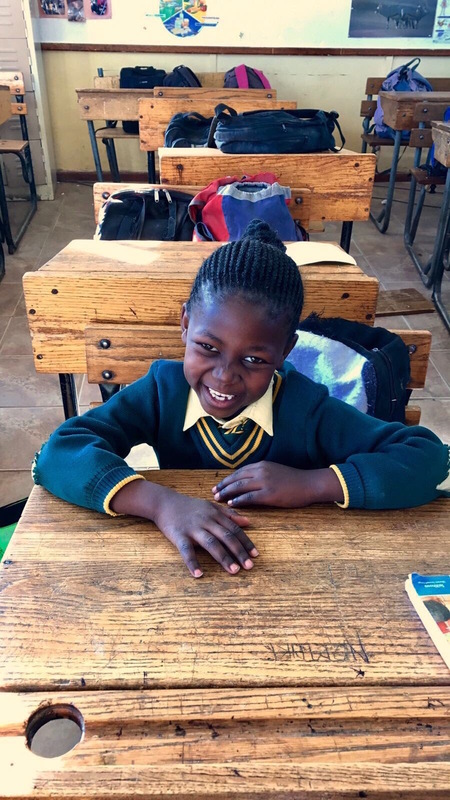 Robin has enjoyed multiple Universal Promise volunteer trips to South Africa, where she has led similar activities for educators, student volunteers, and students in grades K - 7. Victoria Leonard, Website Designer, studied Politics and Religion and organized and lobbied for health as a human right. She has conducted research on food security and import reliance in Senegal, worked with Ghanaian women to establish a sustainable water business, and traveled with Universal Promise in her capacity as a Leadership and Empowerment Liaison and a healthcare volunteer who assisted with home-visit physicals and led health education sessions. Victoria has also lived in Tanzania for one year as a Princeton in Africa Fellow at CCBRT in Dar es Salaam.